As some of you may know (those who are close), Kim HATES surprises. More-so, she hates clowns, and there may, or may not be a video of Lanny Donoho dressed up in a clown suit hiding on a bathtub inside the bathroom scaring the bajeezus out of her. Said video may present itself sometime soon. Needless to say, Kim’s done everything possible to avoid any and all surprises, which have made it IMpossible to ever plan anything for her as a surprise. In the mean-time, to feed her thirst for being a super-sleuth I decided to post a little shot of something involved in her birthday gift. Looks like it might be a pool float to me. I don’t really like surprises in theory, but the few times I’ve been surprised, I loved it. The way in which I “surprised” her helped ease the anxiety, she ended up loving it. A pool float? Way too big, it…I mean they’re smaller. Much smaller. Dude, an inflatable double rainbow? That is wild…! Soooo close, you almost got it except it’s not inflatable, and it’s not singular, and they don’t go in the ocean. Feel free to blurt out what “they” are, I’ll be posting it later today and I’m interested in what people thought these were. That’s easy. 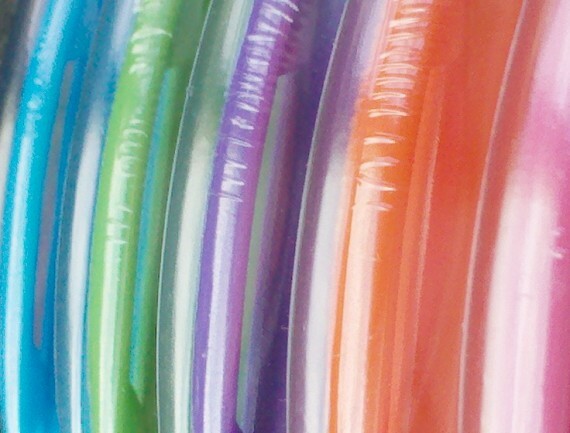 A multi colored Nuva ring. We get it. No more babies. Very creative Ben. I like your style. I think it is an inflatable ocean device that will carry me to a double rainbow!! It also has jelly beans and a ‘drink’ holder or five. Ok – this so looks like something Madi would wear in her hair! I hope Kim is up for the challenge. Love it and have a bundle of fun! This looks like bendy straws – have fun! the largest lollipop ever! except it’s plastic…which is just going to piss her off. Yeah, it probably would. Just like the vacuum cleaner did last Mother’s day. looks like some funky fun colorful bracelets! Jelly, rainbow-colored, Hula-Hoops…that Kim needs to “Hula” using her entire body (hips, arms, legs, neck), while watching a video about clowns? A multi-colored floaty? Happy birthday to Kim! Welcome to the year of the priesthood! so when will we find out?